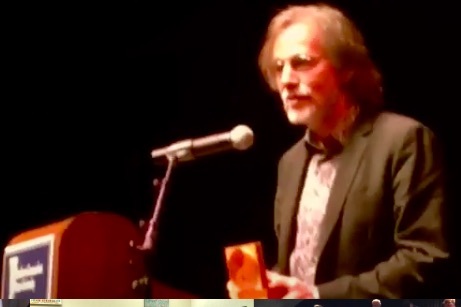 Musician Jackson Browne was honored Friday night for a lifetime of activism by Promoting Enduring Peace, accepting the Gandhi Award, which previously went to Eleanor Roosevelt, Dr. Martin Luther King, Dr. Benjamin Spock, Linus Pauling and Cesar Chavez, among others. Browne was the first performing artist to receive the award. Roosevelt was the first winner, back in 1960. Promoting Enduring Peace is based in New Haven. Meanwhile, “my education has been advanced by the contact with all those committed activists, working on all those fronts,” he said. Browne’s acceptance speech was political at times, with him saying, “the United States must rejoin the world and put the planet first.” He also suggested it’s time to move toward “enduring peace” rather than “enduring war,” saying that the U.S. hasn’t really been at peace since before World War II. Browne was introduced by environmental activist Robert F. Kennedy Jr., who said Browne “walks the walk” — right down to having a windmill on his farm in California. “He understands that the environment is intertwined with democracy,” Kennedy said. Browne did not perform for this gig — although he said he was a horrible speechwriter and would have preferred to sing. That honor went to Ben Grosscup and Luci Murphy of the People’s Music Network, described as “a group of people who follow in Jackson’s footprints” in terms of using music to promote activism. “We are so happy to be part of this event, honoring Jackson” for the work he has done, said Grosscup, the group’s executive director. Other speakers included SCSU President Joe Bertolino, city Director of Arts, Culture & Tourism Andrew Wolf — who read a proclamation from Mayor Toni Harp declaring it “Jackson Browne Day” in New Haven — Frida Berrigan, Chris George of Iris, PEP Administrator Stanley Heller and PEP’s James C. Van Pelt. “Like so many of you — and so many people around the world — we were raised on the words of Jackson Browne,” said Wolf. Browne, in response to the Three Mile Island nuclear plant malfunction in 1979, co-founded Musicians United for Safe Energy, MUSE. The group had a series of benefit concerts in New York City that year and a movie of those shows, “No Nukes,” followed. In the late 1970s, Browne also joined the protests and occupation at the Seabrook nuclear plant site in New Hampshire. Browne also was active in the Central America solidarity movement, co-organizing shows in Nicaragua, Cuba and elsewhere. He is a member of the group Ocean Elders who more recently has focused on the environmental crisis in the seas, where plastics threaten wildlife. Browne last December released the song “The Dreamer” about the new deportation threat under the Trump administration for those who had been protected temporarily under the Deferred Action for Childhood Arrivals.